If you look at a modern fly reel, you'll see that a good part of its design is devoted to providing the angler both a drag system and some form of help with line management. I started designing and building my own fly reels because I wanted a reel that did away with both these encumbrances. I originally learned to fish for trout in the "Fight the Fish with the Hand and not with the Winch" philosophy, which dictates that the fish is always fought with the stripping hand and never with the reel. 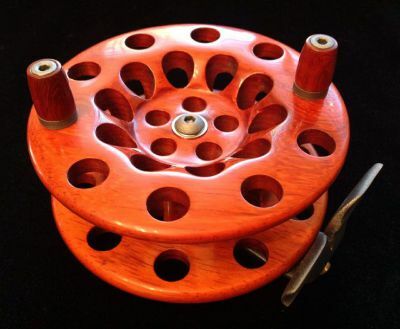 This being the case, I obviously never had any use for a drag on a trout reel. To me, it was always an appendage that had no discernible purpose. After a few years of single-hand fly fishing, I no longer needed help from the reel to manage my line. The line guide and cage started to seem superfluous and bulky. 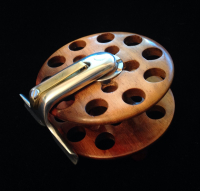 When I started dreaming of the perfect fly reel for myself, the result most resembled an ancient wooden-spooled reel I had seen from before fly fishing and bait fishing broke into separate distinct disciplines -the Scarborough reel. 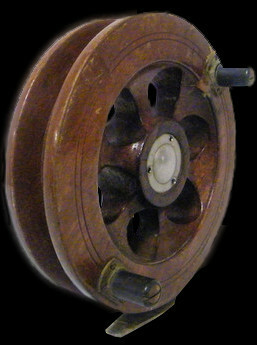 This most basic of all mechanical fishing reels had a simple offset metal post and mounting foot instead of a frame. The wooden spool and its spindle were cantilevered off the post in line with the rod. There was no cage, no line guide, and no check or click. Since my dream reel was one that did away with these things, the Scarborough was where I decided to start. to a lightweight aircraft aluminum one, and designed a unique, hot-worked split mounting foot in order to make the entire thing a single forged part. I changed the spindle to machined stainless steel and devised a way to securely anchor it to the aluminum bracket. To protect the aluminum from wear and corrosion, I went with an oven-cured powder coat finish -which can be applied as thick as desired and is arguably more durable than common anodizing. Powder finishes also have a truly vast array of options in colors and textures compared to anodizing. 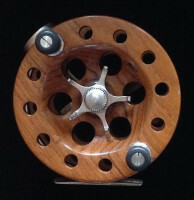 I chose to work with exotic hardwoods for my reels. I like their character and strength. They're warm, smooth, varied, deep and beautiful. They're also comparatively strong and light. To protect the wood against wear, fresh and salt water and atmospheric effects, I came up with a super hard, thick acrylic finish with an involved application process that thoroughly seals them, and has the added advantage of being repairable if chipped or scratched. 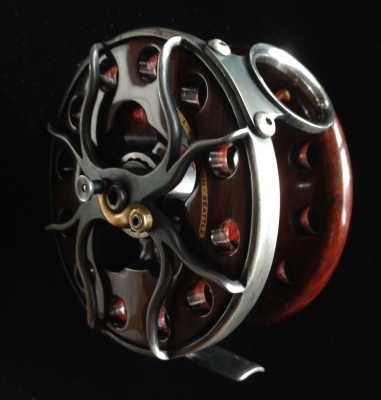 With the proper care, these reels should last forever and only get more beautiful as they are passed down. I've always enjoyed the challenge of creating mechanical objects that utilize the varied material working skills I've practiced over the years. I also find there's something viscerally more "complete" about an object that combines varied natural materials like wood and metal in its construction. 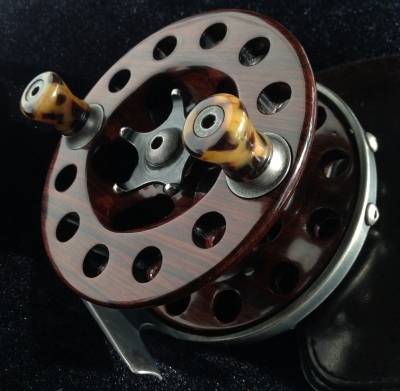 Naturally, a reel's basic purpose is to attach to a rod, carry line, and do it's job as a part of an assembly with a specific utilitarian purpose. But a reel does also stand alone, apart from the rod as its own assembly in the aesthetic sense. 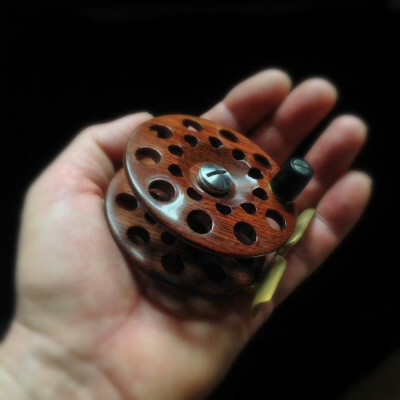 When I hold one of my reels in my hand, it feels whole. Independent of the rod, it still feels complete. It's beautiful on its own or attached. 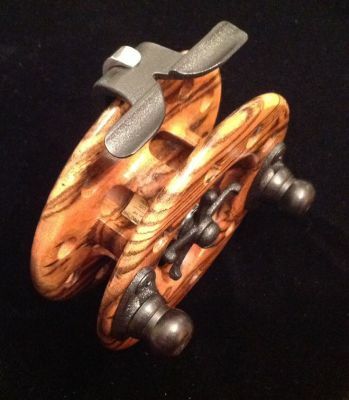 That's what I strive for in every reel I make -beauty combined with genuine functionality.